Subject: 2012 Golden Geek Awards Winners! 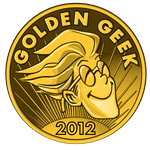 The winners of the 2012 Golden Geek Awards were announced Saturday night at BGG.CON. Here is the complete list of winners in all categories. Eclipse as game of the year looks good to me! I guess in light of the technical difficulties on Saturday night, it's only fitting that these are on BGG.com 47 hours later! Good job all around. Loved the "voice projecting" during the ceremony. Shouldn't the D-Day Dice link go to D-Day Dice: Free Trial Version? D-Day Dice is not a print & play. Yes, thanks for correcting me. Well, it's not a 2012 game in the first place. But it is undeniably a print and play. If a version of Risk was going to win game of the year, it should have been Risk: Legacy. I get that there is a Pnp version available. That the merits (and players) of the PnP earned (voted for) this award is entirely deniable! Didn't I read somewhere about a voting campaign on the DDDice website that linked to the full game? Yeah, I wasn't contradicting you, just pointing out that each of the two BGG entries has its own snag when it comes to being eligible for the prize. No offense to the designers of D-Day Dice, but that's the only one on this list I disagree with. BSG : Express was probably the best PnP of the decade, but I don't think enough people on here play high component PnPs to know about its perfection. Congrats to Sekigahara! It's a great game and I'm happy to see it win. Congrats to all winners, with an except for the abstrac. Kingdom Builder? really? Wow ... Eclipse as best strategy. Poor Stefan, with his 2/3 chance. As much as I am a fan of original Netrunner, I'm glad to see its newer cousin getting some nice press. Shame, though, I was hoping Morels would take something home, but it didn't even make the finalists. And I agree about Kingdom Builder, btw. Overall, a pretty decent list. I feel like it must have been a sparse year for expansions for Factions to take that though ... Really, there was nothing better? Kudos to King of Tokyo taking so many awards. It's about the only dice-game I actually enjoy, and I enjoy it very much. Yes - it's pretty abstract. Wow, great choices. I think each of these award winners has earned the award it was given. Best abstract game of the year? Must have been a slow year for abstracts. Hats off to Takenoko, one of the most striking visual presentations I've seen this year. Happy to see them win. But as for King of Tokyo...I just don't enjoy that game. Must be in the minority though. Perhaps it won because it was the only abstract a lot of people played? The voting method might be a little flawed if that's the case. For shame too, Fealty is infinitely better. Also--wow, a list of winners I can agree with! (Well, you can keep Kingdom Builder.) This is completely refreshing, I look at a lot of awards lists like SdJ and Origins and feel like I'm not even part of the same hobby. But these winners? Full of WIN. Congrats to all the publishers and designers!